Happy New Year! You can probably guess one of my new year’s resolutions for 2012 – regular blog posts, of course. I thought I would start off by sharing some images of a project from 2011 that ended up being a pleasant surprise. A friend discovered this lovely but very damaged watercolor landscape in the cellar of his Arts & Crafts bungalow in Swampscott, Mass. He and his partner are the second owners of this amazing home and have been lovingly restoring it to its original beauty. The house was built in 1910 and the family who lived there were avid art collectors and friends with a number of local artists. The watercolor bears the signature “E. H. Snow” in the lower right corner, and initial research suggests the artist may be Eben H. Snow (1870-1945). 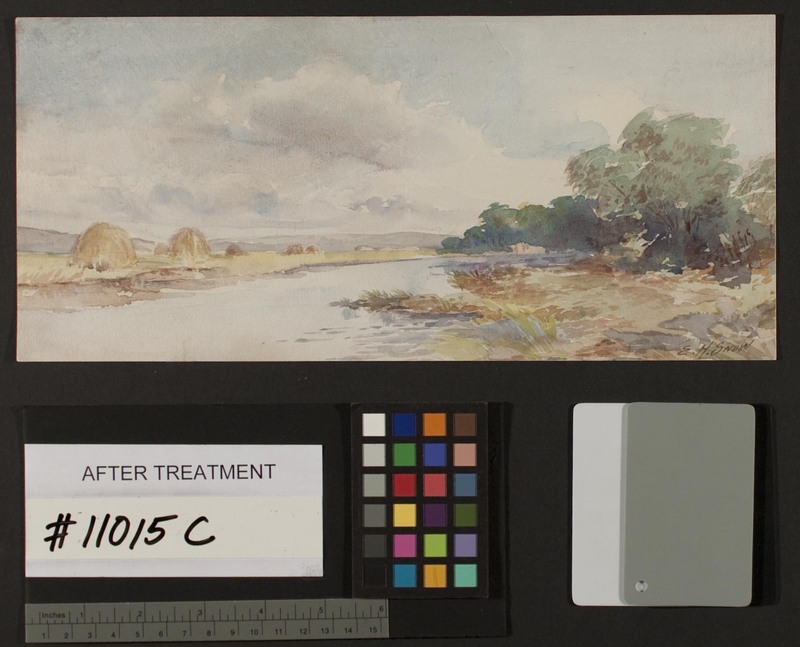 Snow lived and worked in Massachusetts, and a graphite inscription on the reverse of this watercolor identifies the scene as the Neponset River. Snow was known for his impressionist style landscapes and maritime scenes and primarily worked in oil on canvas. Perhaps this small watercolor is a plein air study for a larger painting? The haystacks depicted in the distance certainly were a popular subject with Monet. 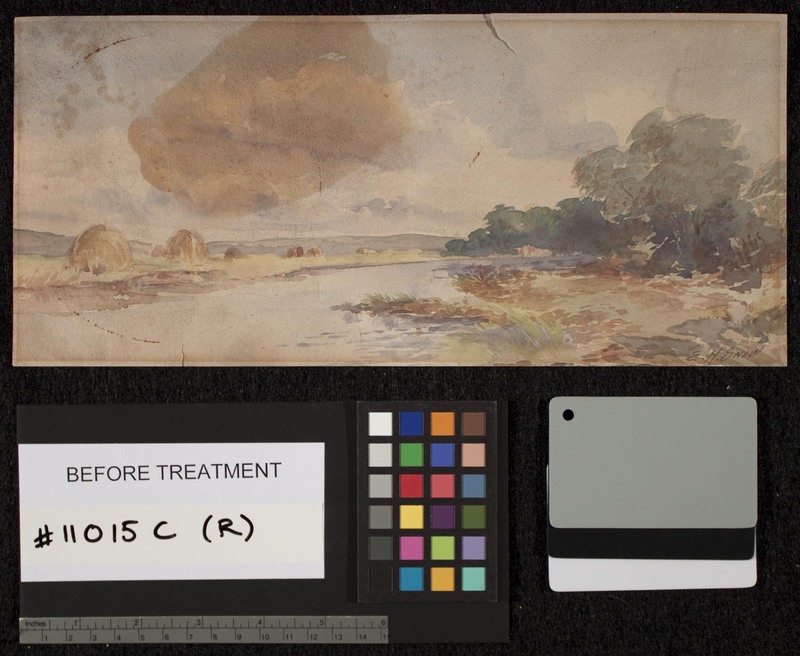 This watercolor was discovered in the cellar on a work bench amongst glass that had been removed from other picture frames. Years of being stored in the basement resulted in severe local stains (perhaps oil from the furnace? ), rust deposits, and a heavy layer of soot. The watercolor also had the more typical mat burn and overall discoloration caused by exposure to light when it was framed and displayed on a wall. 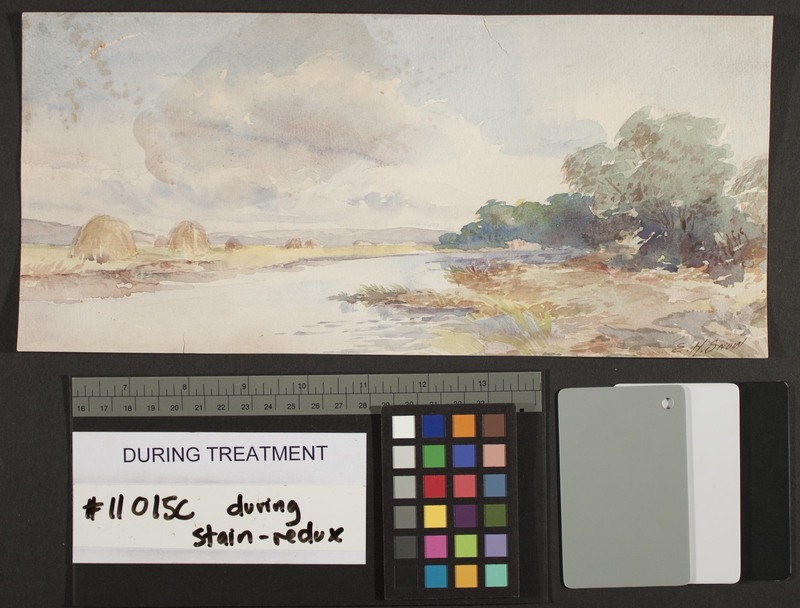 When I initially examined the watercolor, I was somewhat skeptical about how much the largest stain might actually reduce during treatment. 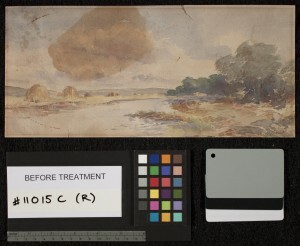 However, this little painting really responded well to conservation treatment, especially controlled exposure to artificial light. As you can see, the overall discoloration and the disfiguring large stain really lightened up a lot. I continued with a little bit of local stain reducing, and finished the treatment by lightly retouching the remaining stains with dry pastel pigments. The pastel can be safely removed from the surface of the paper in the future if necessary, meeting the conservation requirement that the treatment be reversible. Quite an improvement! I am looking forward to seeing this painting again once it is framed and on the wall in my friend’s home. This was my great great grandfather!!! My family still owns dozens of his pieces. How exciting it was to find this post. I myself am an oil painter.